Lincoln Electric has announced the acquisition of Baker Industries, Inc.. Baker is a privately held Detroit, Michigan-based provider of custom tooling, parts and fixtures primarily serving automotive and aerospace markets. Baker has extensive in-house design and manufacturing capabilities, including machining, fabricating, assembly and additive manufacturing. The Baker organization will complement Lincoln Electric’s automation portfolio and its new metal additive manufacturing service business that will launch in mid-2019. Leveraging Lincoln Electric’s core competencies in automation, software development and metallurgy, the new metal additive business will manufacture large-scale printed metal parts, prototypes and tooling for industrial and aerospace customers. The Baker operation, along with a new Cleveland, Ohio-based additive manufacturing development center, will provide an additive manufacturing platform to help customers improve their lead times, designs and quality in their operations. Lincoln Electric’s automation revenue is approximately $500 million in annualized sales with the addition of Baker Industries. Terms of the transaction were not disclosed. Air Liquide has announced a $12 million equity investment in FirstElement Fuel, Inc. (“FEF”), a market leader in developing, owning and operating hydrogen refueling stations in California. This investment will help enable the ramp-up and deployment of hydrogen fueling infrastructure in California, including the further expansion of FEF’s “True Zero” branded retail hydrogen station network. California currently has the largest number of fuel cell electric vehicles (FCEVs) and the state’s initial retail hydrogen station network ranks as one of the largest in the world. This investment combined with the long-term supply agreement Air Liquide recently announced with FEF will help ensure robust and reliable fueling to accommodate the 40,000 FCEVs expected to be deployed in California by 2022. Lincoln Electric is embarking on a multi-faceted plan to raise welding education standards across the nation and beyond through a newly approved partnership with the National Coalition of Certification Centers (NC3). NC3 is a nonprofit network of education providers and corporations focused on bridging the gap between education and industry workforce needs. The new partnership with Lincoln Electric gives NC3 the authorization to administer Lincoln Electric’s Education Partnerships Schools (LEEPS) program and offer new certifications to provide community colleges, technical schools and other post-secondary trade schools with a complete suite of portable, stackable national welding certifications. As part of the agreement, NC3 will develop and issue the LEEPS program’s world-class industry certifications, ensuring strong national standards for welding instructor training, classroom curriculum, competency labs, qualification exams and digital certification issuance. Lincoln Electric will ensure the certifications are in alignment with standards set by the American Welding Society. The plan also calls for establishing a series of national-standard Lincoln Electric training centers across the country as extensions of Lincoln Electric’s Welding Technology & Training Center located in Cleveland, Ohio. Certificates are among the fastest growing credential, providing workers with specialized and advanced training that demonstrates a greater understanding of the key attributes demanded by employers in specific industries. To date, NC3 has supported 110,000 students and awarded 180,000 certificates. 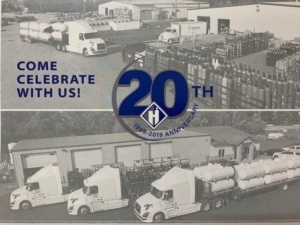 Hydrostat, Inc. is celebrating its 20th year in the cylinder requalification business. From its humble beginnings with four employees and 6,000 square feet of leased space, Hydrostat has grown to occupy more than 45,000 square feet and now employs about 40 staff members. Hydrostat provides service to a variety of different gas industries, including requalifying, repairing and refurbishing cylinders and tanks used to house high-pressure, low-pressure and liquid gases. According to the company, Hydrostat has one goal in mind: ensuring cylinders and tanks are safe for continued use. Hydrostat will be hosting an open house celebration on May 9, 2019, with free safety training by the Minnesota Propane Association as well as facility tours. 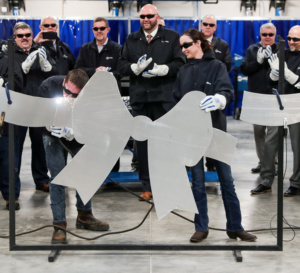 Roosevelt Utah area high school seniors had the honor of cutting a sheet metal ribbon marking the opening of the Uintah Basin Technical College’s (UBTech) new welding technology building on Thursday, March 22. Norco, in partnership with Miller Electric, is proud to support this 13,570-square foot, $4.5 million state-of-the-industry facility with scholarship funding, modern equipment and quality supplies to help them develop the skilled labor force of the future. The advantages of this partnership include the latest welding equipment, supplies and materials at reasonable rates along with access to industry professionals. The UBTech welding program has a history of turning out students who claim top honors nationally as well as internationally with six students who attended the national Skills USA welding competition and another who placed fifth in the world, during a global competition in Abu Dhabi. 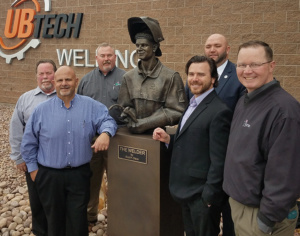 Left to Right: Larry Booth, Norco Industrial Products Manager; George Douzenis, Norco Eastern Zone VP; Scott Weaver, Norco Product and Automation Specialist; Scott Olson, Utah Sculptor; Aaron Weight, UBTech President and Tony Baumgardner, Norco Outside Sales Rep.
AWG has named a new top executive. 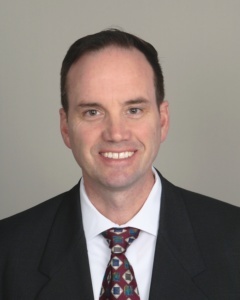 Mike Maxey, current vice president of sales for AWG’s central division, has been promoted to vice president and general manager with sales and operations oversight for AWG’s locations in Illinois, Indiana and southern Wisconsin. A 25-year veteran of the industry, Mike joined AWG in 2017. Under his leadership, AWG has continued to build its brand and develop new partnerships in the central division by providing premier customer care and innovative solutions to gas supply challenges.